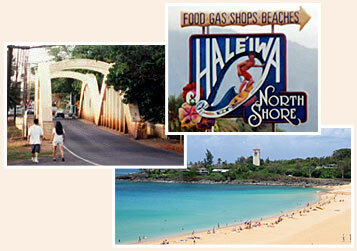 North Shore, Oahu – The famous North Shore of Oahu is about an hours drive from Honolulu. Here in the country one can enjoy the fascinating Polynesian Cultural Center, exotic Waimae Falls Park and the Turtle Bay Resort to name a few. Browse through Haleiwa's charming, unique boutiques, shops, and galleries, or enjoy a wonderful meal at one of the many flavorful restaurants. If you visit in the summer, you'll be delighted with the crystal clear waters, magical tropical breezes and playful wave. Perfect for swimming, snorkeling and other outdoor activities. The picturesque white sandy beaches are tranquil, with unforgettable sunsets. In winter the towering big waves arrive along with the world's most ambitious surfers in search of the perfect wave. Re-known as "the surfing capital of the world", the beaches are host to many surf contests.